Canon PowerShot G16 lens review: High speed, High IQ? With their high-quality build, full manual control, high-grade zoom lenses and Raw file option, Canon’s G-series compacts are rightly popular with enthusiasts. 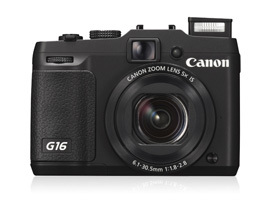 The PowerShot G16 is this year’s update to the firm’s high-end G15 model with a 12.1-MPix 1/1.7-inch BSI-type CMOS sensor and new Digic 6 with sensitivity running to ISO 12,800. First featured on this model’s forerunner, the PowerShot G15, the zoom is a high-speed model the equivalent to a 28-140 mm f1.8-2.8. Not only does it have a bright variable maximum aperture but also it’s an image-stabilized lens and, unsurprisingly, has a complex optical construction. It has 11 elements in total, arranged in 9 groups, with one single-sided aspherical lens element, two double-sided aspherical lenses and one UD (low dispersion) glass element. 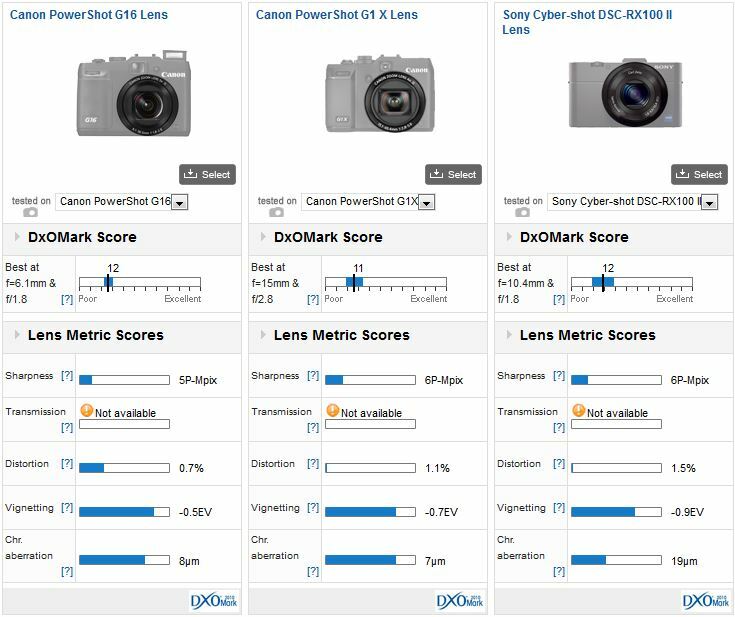 The lens achieves an above average DxOMark score overall of 12 points. Given the relatively low sharpness score, of 5P-MPix, the lens performs very well for this type. Although, the bright variable aperture is one of the selling points of this particular lens, we’re unable to test the actual transmission values. However, it has consistent IQ throughout the zoom range, and has relatively low vignetting, distortion as well as good control of chromatic aberration. We’ve yet to analyze the lens of this model’s traditional rival, the new Nikon Coolpix P7800. But, when compared to serious challengers, in the form the firm’s PowerShot G1X and the Sony RX100 II with their physically larger, higher pixel count sensors; the performance of the G16 model’s lens gains some perspective. Overall sharpness is lower but it is well corrected and has several benefits. It has less variance in IQ across the zoom range, lower distortion and better control of peripheral illumination (vignetting). Chromatic aberration is also very low compared with the Zeiss branded zoom of the Sony. The lens used on the G16 has the advantage over those models of projecting a smaller image circle, but, with the exception of outright sharpness, it’s a good performance overall. 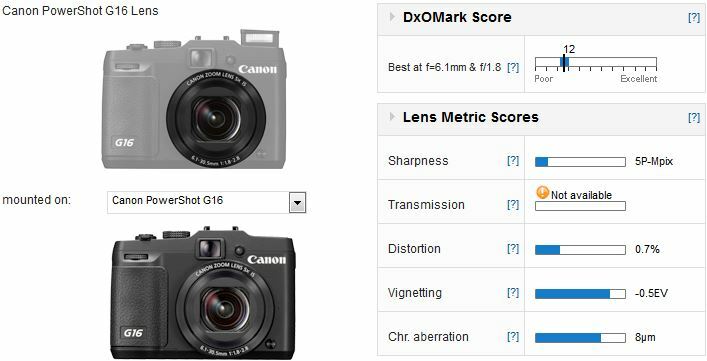 From our previous tests, we’ve already seen the sensor performance of the PowerShot G16 is on par with rivals, but that’s only a part of the imaging chain. Often it’s the case that fast zooms like this are compromised in some way. And, while sharpness could be improved, the lens is consistent performer throughout the zoom range. At $549 the Canon PowerShot G16 is not inexpensive but it has a good balance of performance and value when compared to rival offerings.